No one wants to be told they snore. Yet millions of people are regularly kept awake at night by the loud snoring of their partner, preventing them from getting the restful sleep necessary to function the next day. Unfortunately, snoring is not only a nuisance to your bed partner; it may be a symptom of a condition that places you at risk of serious health issues down the road. At the Center for Dental Sleep Medicine, our dentists offer a variety of treatments to help you stop snoring and eliminate the dangerous health risks associated with this condition. Please call 201-792-9400 today to schedule your consultation at our Hoboken dental office. In most cases, snoring is a sign that you may have sleep apnea, a dangerous condition that results in brief interruptions in your breathing while you sleep. The actual cause of snoring is a blocked airway occurring when the soft tissue in your throat relaxes while you sleep. As your airway becomes blocked, your soft palate and uvula vibrate when you breathe. These vibrations are heard by others as snoring. But your snoring doesn’t just affect you. A study conducted by the Mayo Clinic found that bed partners of snorers lose approximately an hour of sleep a night. This disruption in the sleep of your partner can lead to chronic fatigue and an impairment of your motor skills at a similar level to someone who is legally intoxicated. This can be especially dangerous when getting behind the wheel of a car. 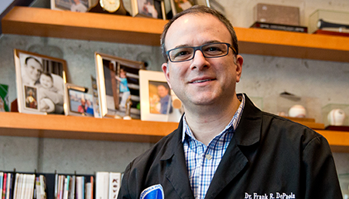 Dr. Frank has a sleep physician on staff, and he will work with a sleep center in New York City to accurately diagnose and treat the cause of your snoring. In some cases, minor lifestyle adjustments such as sleeping on your side, changing your diet, or reducing alcohol intake can help you stop snoring. If you are tired of snoring or of being woken up by a partner who regularly snores, our Hoboken sleep apnea dentists will work with you to find a solution that lets you sleep soundly through the night once again. Please contact the Center for Dental Sleep Medicine using the form at the right side of the page or call 201-792-9400 today to schedule your initial sleep apnea consultation. 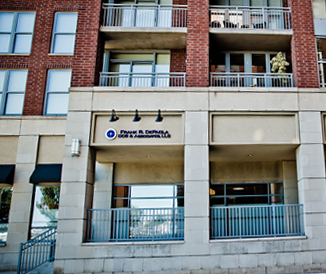 Dr. Frank DePaola serves patients in Hoboken, Jersey City, and throughout Hudson County, New Jersey.